BANGKOK, THAILAND - JANUARY 23, 2016: Time-lapse view of the statue inside Wat Pho Temple on January 23, 2016 in Bangkok, Thailand. 4k00:11BANGKOK, THAILAND - JANUARY 23, 2016: Time-lapse view of visitors pass by outside of Wat Pho Temple on January 23, 2016 in Bangkok, Thailand. 4k00:11BANGKOK, THAILAND - JANUARY 23: Time-lapse view of visitors pass by outside of the Wat Pho palace on January 23, 2016 in Bangkok, Thailand. 4k00:11BANGKOK, THAILAND - JANUARY 23: Time-lapse view of visitors pass by in the garden of the Wat Pho Temple on January 23, 2016 in Bangkok, Thailand. 4k00:12BANGKOK, THAILAND - MARCH 20th: Stupa and tourists at Wat Pho temple in Bangkok, Thailand on March 20th, 2017. 4k00:13Wat Chiang Man with Stucco sculpture elephant pagoda, Chiang Mai, Thailand. 4k00:07Bangkok, Thailand-April 12, 2018: Tourists walk inside Wat Pho or Temple of the Reclining Buddha, Bangkok. 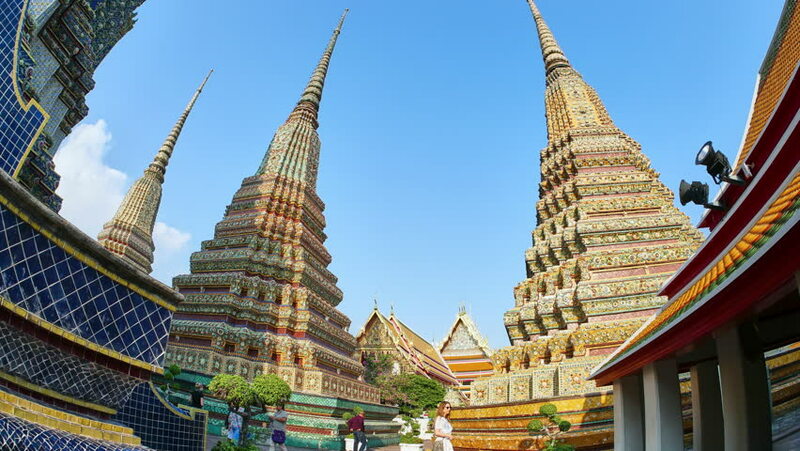 It is one of the oldest temples in Bangkok, and a famous travel destination in Thailand.